I did a little cheap mod to it. I'll get some pics up soon and show you how easy it is to get a little more throttle response and a better sounding exhaust. Seems like most of the aftermarket stuff for this bike is way expensive and not from the USA...so one must improvise. Ok folks, pictures as promised with a little tutorial. 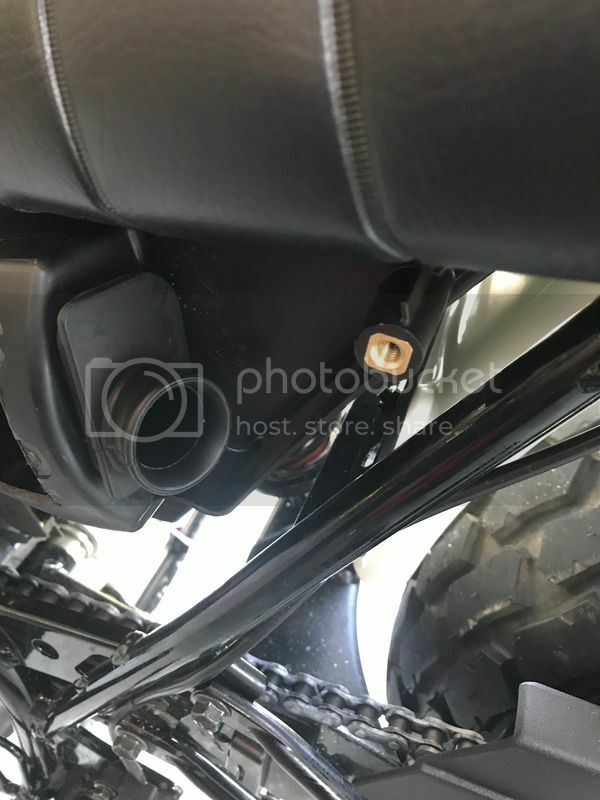 Here is the snorkel located behind the left side cover. It comes out easy...Note the small hole this engine is getting its air from...That's all about to change. I used a dremmel tool to cut an extra opening to get even more air. Now the engine has adequate air. Using an 1 1/8" hole saw, drill around the existing tiny exit hole. 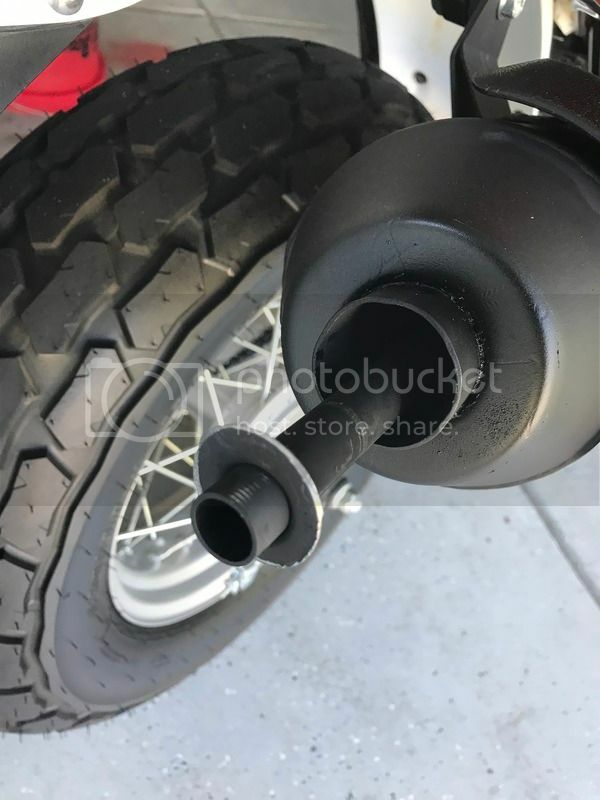 Take a pair of pliers and wiggle back and forth and pull the tiny exhaust tube out...Pretty simple. I took these pictures after the project has been complete so I'll try and fill in the blanks. Now, take a 1 1/2" hole saw and continue making the rear of the exhaust can opening larger. Once you have that 1 1/2" openeing at the end, take the 1 1/8" hole saw and drill through the first chamber plate, then drill through the second chamber plate or as some call them, baffle plate. 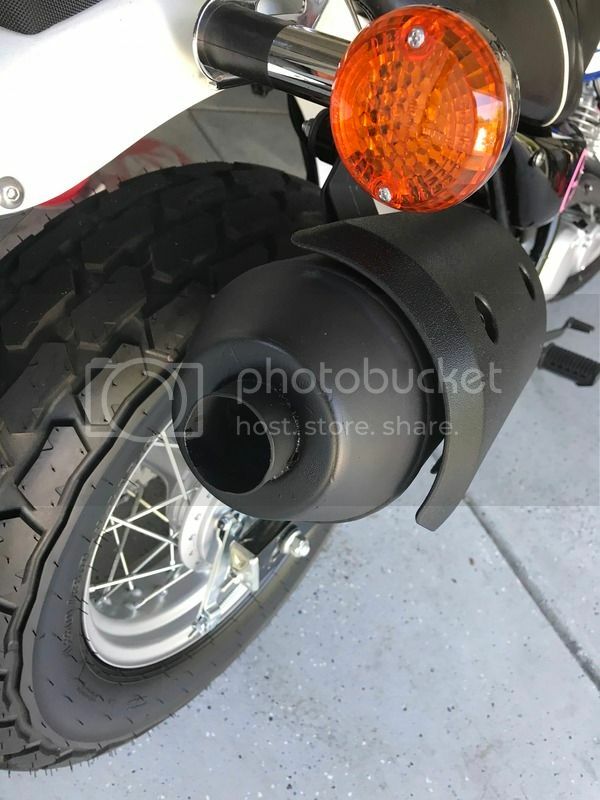 Now you have to put the tail pipe in. I used a 1 3/8" X 1 1/2" adapter I picked up at the auto parts store for $3. Note, I did have to file out the 1 1/2" hole just a bit for the adapter to fit. Put the 1 3/8" in first and use a block of wood or something not too hard and a mallet to tap the rest of the adapter in. 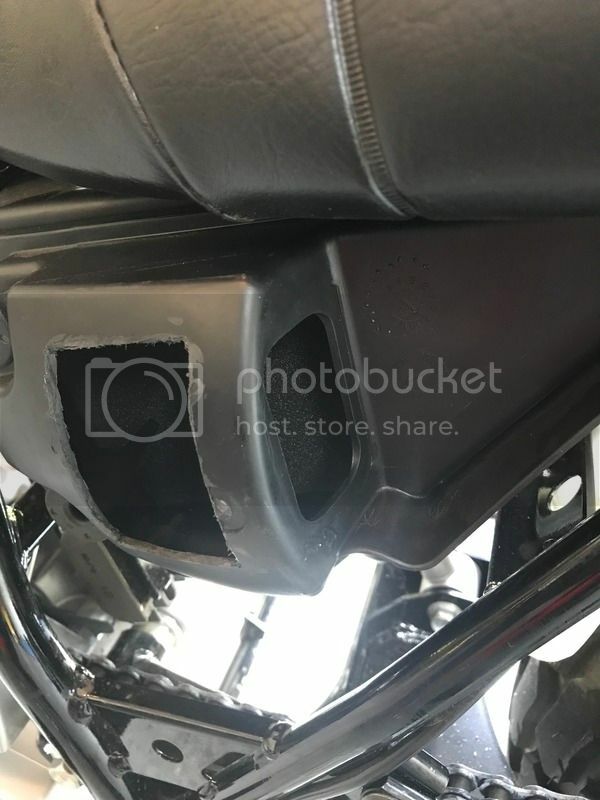 As for a spark arrestor, I went to Home Depot and picked up a universal sink strainer set, cut the largest screen out, molded it and shoved it in to the 1 1/2" side of the tail pipe...Using J/B weld liquid epoxy, I glued the screen to the inside of the pipe. I also put a small bead of epoxy around the the tail pipe and the end of the muffler to seal and hold it even better. After it dried, I painted the rear of the exhaust pipe with flat black engine enamel. 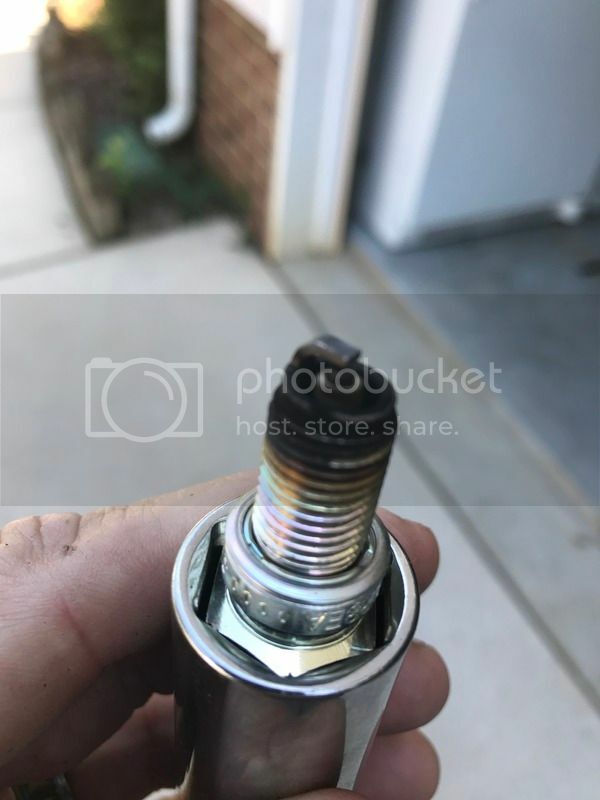 After start up, I looked at the spark plug...Looks ok but getting a fuel programmer would prolly be worth it now. Does this increase horsepower and torque? Umm maybe, I don't have a dyno but the seat of the pants dyno noticed a little difference, manly in throttle response. I have noticed that at start up when cold, if you try and throttle up and down and back up again, there is a hesitation but once it's warm, she throttles up and down nice and smooth. That's actually pretty interesting, but wouldn't a lot more garbage get trapped up in the air filter? The video isn't working unfortunately and I really do want to hear what it sounds like !! And yes, the air filter will dirty up faster...but that ok as long as one keeps an eye on it. That's actually pretty darn good for $20 and some elbow grease ! But okay okay that makes sense, just periodically take it out and blow it clean, throw it back in there until it gets bad enough. hey archangel44, any chance you can repost your photos without using photo bucket? 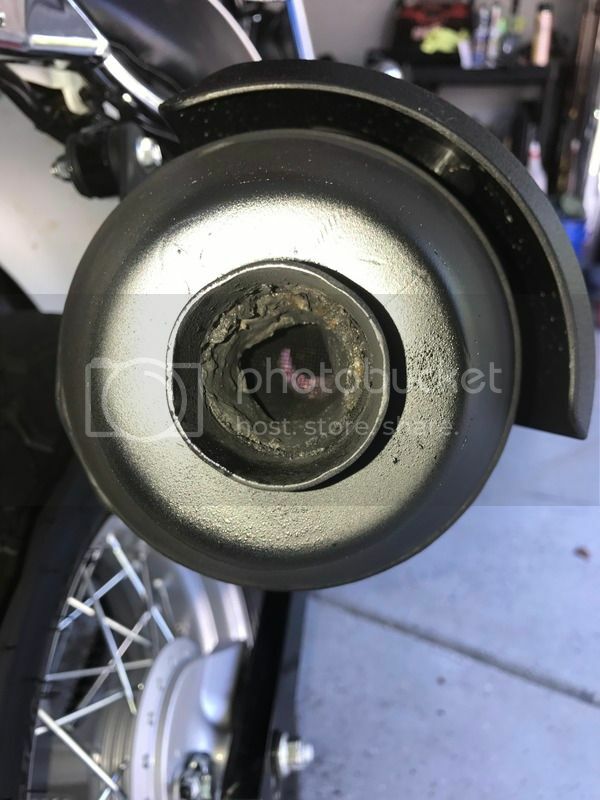 Check under the exhaust section. I posted the photos there. Ya, Photobucket now wants money...I guess advertisement isn't enough.